Parts purchased, prices compared, and lessons learned. I recently setup 10 soldering stations for a total cost of $105 CAD to use with the Himalayan Makers Guild in an introductory soldering activity. Purchasing soldering equipment here in Nepal had its advantages and disadvantages. On one hand, it cost 1/4 of what it would have if I’d purchased the parts from Amazon, but a sacrifice was made in the quality of the tools. A detailed parts list and price comparison between buying in Kathmandu or online from AliExpress or Amazon is provided in this spreadsheet (or as .xlsx) along with links to purchase each item. Note that the prices from AliExpress and Amazon do not take into consideration shipping costs. Two complete soldering stations. They share solder flux, wire strippers, flush cutters, and a multi-plug extension cord. One solder sucker could also be shared between two stations. 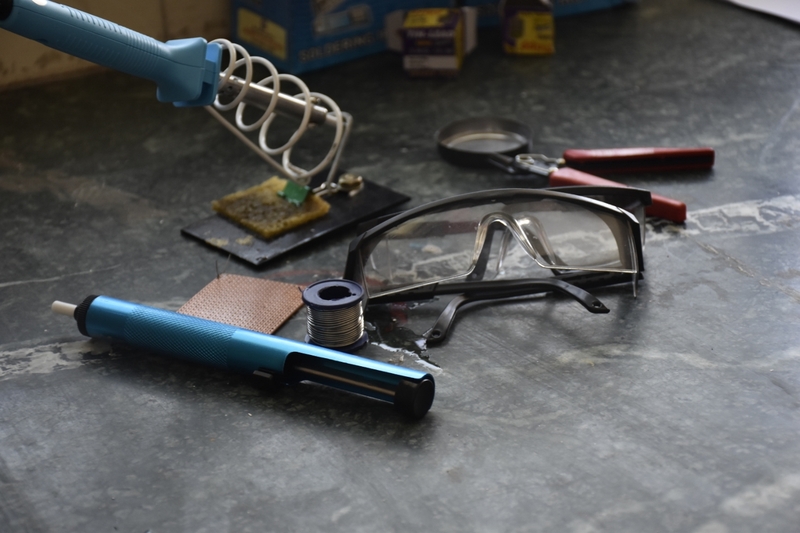 Each station includes a soldering iron, stand, sponge, solder, and safety glasses. The soldering irons can easily damage table-tops, so having a heat-resistant working surface is important. Here we are fortunate to have stone counter-tops. A cheap alternative is to cut squares of wood fibreboard (MDF) to place under each soldering station. If I were buying the soldering stations again, there are a couple of things things I would do differently. I would spend a bit more money to purchase soldering irons that have a power-indicator light. Power-outages are common here and the plug connections are unreliable, so having the indicator light would help the students understand if their iron is working properly. I would also purchase brass sponges rather than wet sponges for cleaning the irons; they are more effective and last longer.